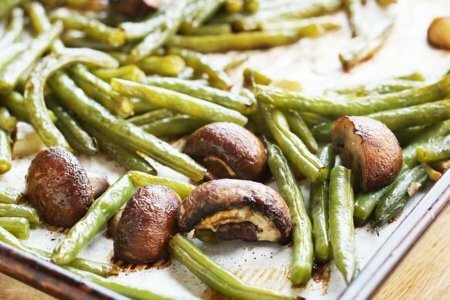 Balsamic roasted green beans may replace green bean casserole if you give them a try. I have been thinking about green bean casserole a lot lately and wondering how to replace it. These green beans are delicious and you can pretend you are a gourmet. I happen to love green beans and eat them all the time. My favorite recipes include my recipe for sautéed green beans with garlic and my refrigerator pickled green beans. This recipe is not only simple, but it makes your house smell really good. It kills me how easy it is to make vegetables taste delicious – and how little time we take to do it. I am guilty of eating the same boring stuff all the time. Then I work on a recipe like this and I wonder what is so hard? Washing, slicing, and tossing vegetables onto a baking sheet is easy! The hard part of making this recipe for me is getting motivated to move past that boring Romaine salad that I eat every other day. I know I am not the only one with this problem because sometimes I wear reflective sunglasses and walk around the grocery store. The glasses are so that no one knows that I am staring into their cart. I peek and see what others are buying and I am amazed at the lack of diversity of food. Everyone has the same frozen meals, chips, and orange juice. Mostly, I do this so that I can think about what I can do differently to help motivate others to eat more vegetables. This dish can be served hot or at room temperature. The versatility of roasted vegetables knows no limit. Put them in a quesadilla, a salad, on your eggs, in a sandwich, or on ice cream (not). I like to add these to my boring Romaine salad to make it fancy. I add feta to the top to make it more like a meal. Will this recipe help you eat more vegetables? Heat oven to 450 degrees. Line a baking sheet with parchment paper. Put beans, mushrooms, and garlic on the sheet. 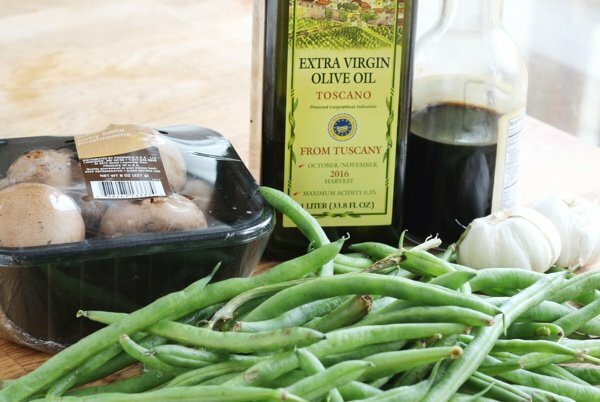 In a small bowl, mix olive oil and balsamic vinegar and pour over beans. Mix with your hands and add salt and pepper. Roast for 20 minutes or until beans are tender. Serve immediately or store in the fridge for later consumption. Why parchment paper and not foil? Does it only have to do with dirtying the pan and making cleanup easier? What is your suggestion to substitute for the garlic? Or at least minimal garlic and an herb, maybe rosemary? I'm not a fan of mushrooms, but you had me at the garlic! I can't wait to try this - oh so easy - recipe! @Helene - great question! You can use foil here but I like parchment paper because nothing almost EVER sticks to it. I have had stuff get stuck to foil. Go ahead and spray the foil with non-stick spray so there isn't a problem. You don't need to use either foil or parchment paper - it just makes clean up easier. @Liz - just skip the garlic - it will still be yummy. 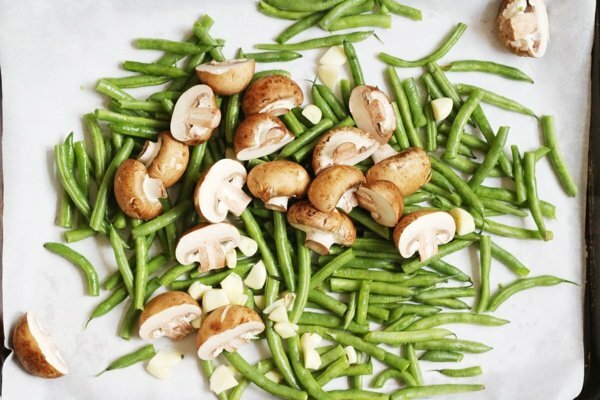 How would you adjust the recipe if you use frozen green beans? Would it work to use them? @Beth - I don't think it would work with frozen green beans because they have been parboiled and therefore will be mushy. I have tried roasting frozen vegetables and it rarely gives great results. 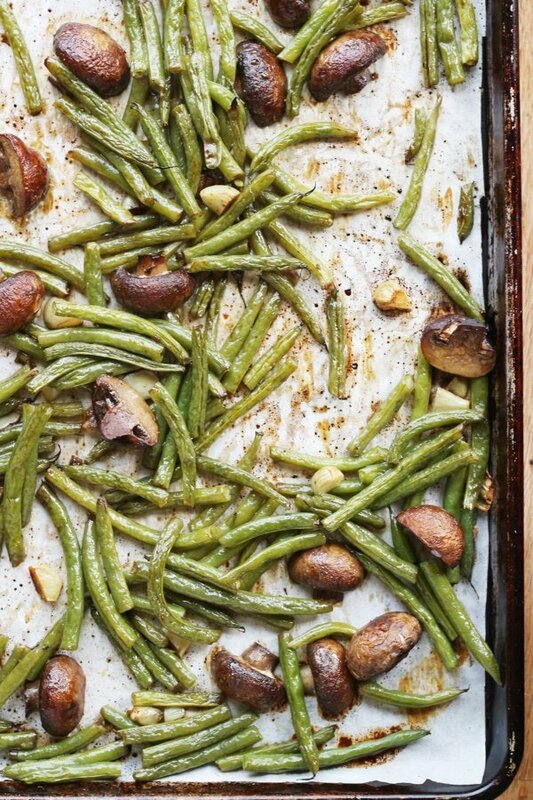 I roasted green beans for Thanksgiving, but I wish I'd had this recipe. Balsamic vinegar--what a great idea! I'm going to make it tonight! Since we have been watching our weight, I have used almost the same recipe (using spray olive oil instead of teaspoonfuls). I am also allergic to garlic so I use leeks, red onions, or shallots instead of garlic. Often I just double wrap all of it in foil and throw it in the grill next to our meat, chicken, or fish. Works well with Brussels sprouts and broccoli rabi. Love the roasted green beans. I do not like salads using cold foods so I roast or grill most of my vegetables. I also like salads that have warm or cooked foods. I do not know why I had not thought of roasting green beans. I love your information. Your ideas are ALWAYS so practical and helpful. Yum! Maybe I will serve this at Christmas dinner! Not everyone in my family likes mushrooms; more for me! The only mushrooms I like are portabella and love adding balsamic vinegar. Thanks for the recipe. I love green beans but those do not look appetizing to me. They're shriveled up. We LOVE this recipe - and it gets rave reviews when I serve it - many thanks . Also parchment paper is healthier than using aluminum. Most people today are trying to reduce their toxic load, and we don't want a bunch of cooked aluminum on our food! Love roasted green beans, but I've never added garlic - making this recipe today to add to my work lunches this week. Thanks!